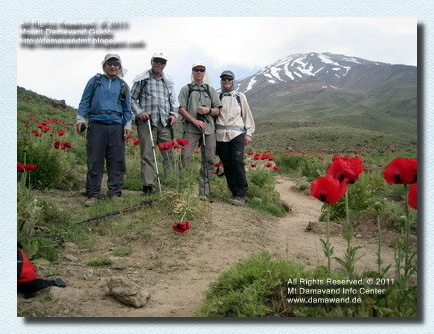 This is just a sample of trip reports published in Damavand Tour guestbook. For the latest Damavnd travel recomendations, trip report and testimonial please visit Damavand Guestbook. Thank you very much for your service, help and hospitality during our visit to Iran and Damanvand July 2011. We are a couple from Norway who wanted to visit Iran summer 2011. It was a mix of mountaineering and cultural experience. We arrived at IKA airport around midnight 02 july 2011. We were met by Soltani at the airport. After some shopping and money change, he drove us to Poulour camp at the foot of the mountain. We arrived at 03.am. We had a room for ourselves, and a bathroom. The next day we slept long. After a heavy Iranian breakfast, we drove to the place where the road to camp 2 took off from the main road to Reyneh. We wanted to walk to camp 2 as a part of our acclimatization. After a short while, Marianne threw up the breakfast. It helped and we reached camp 2. On the way up we could see goats, sheep, horses and honey bees. 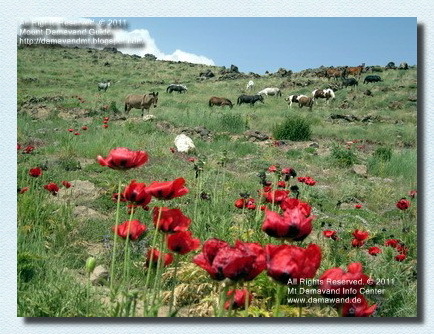 There was a magnificent view of Damavand and a great variety of flowers. The next day we planned to move up to camp 3 at 4.200 masl. We drove all the way up to camp 2 by 4WD car, at 3.000 masl. The road was bumpy but it was no problem. At camp 2 there is a mosque and possible to buy water, tea and even stay overnight. We had a look at a cave that was in fact a house. Warm in winter, and cool in summer. The path to camp 3 was not too steep, but due to altitude we went very slowly. On the way up there was a lot of natural sculptures made of volcanic rocks, amusing. The luggage was carried by mules. There is an old camp 3 just below the new one, where we stayed. It was a rather big hut made of stone, quite new. It belongs to the Iranian Mountaineering Association. We had a small room for ourselves. There is no heating, but a solar powered light system. The following night was bad. We both had severe headache and couldn't sleep. But it helped to hyperventilate quite often to saturate the blood with oxygen. Soltani recommended Diamox and Marianne decided to use it. Later that day the health condition improved and we went up to 4.600 masl. The evening was spent relaxing around the hut. The next day was summit day. Soltani woke us up early in the morning at 05. am. The weather was good and we were optimistic. Soltani had taken with him a friend Mojtaba. 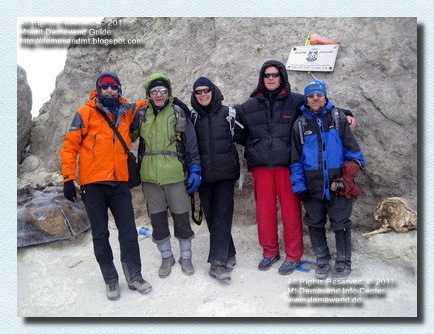 Mojtaba had been to the summit 198 times. Soon to be the first known 200 times summiter!!! We went very very slowly. Soltani set the pace. We stopped shortly now and then, drinking and eating snacks. Marianne and I brought two cans of cola which we drank before the last section of the climb. As we came closer to the summit we could smell the sulphur gazes and we passed the big geysir of smoke just before the top. The summit was reached after 7 hours. It was a great satisfaction to have made it!!! We stayed at the summit for half an hour, to take pictures and look at the view. We felt we were at the top of the world!! As we started the descend we were surprised by a blizzard. But the down jackets kept us warm. It was a problem the sulphur crystallized on the sun glasses and it was hard to see. Shortly after the wind calmed down. The descend took us 3 hours. We spent the night in camp 3. The next day was holyday in Iran and there was a huge amount of people coming up to scale the mountain. We realized we had been lucky to climb on weekdays. All the newcomers were smiling and exited to be on the mountain. As foreigners we were met with kind curiosity. Well down at camp 2 we were driven to Poulour. After a short stop for shopping and eating Soltani took us to a hotel in Theran. And the first part of our trip was over. The next part was a cultural tour to visit some of the places in Iran that could tell us something of the country´s rich history, culture and civilisation. The people of Iran is very polite, curious and interested in talking to foreigners. It was absolutely no problem traveling in Iran. All we can say is. Pack your gear and go to Iran!! Specialist in Damavand guided tours and ascends. Info for mountaineering, rock and boulder climbing tour. Damavand tour 2015 trekking and climbing. 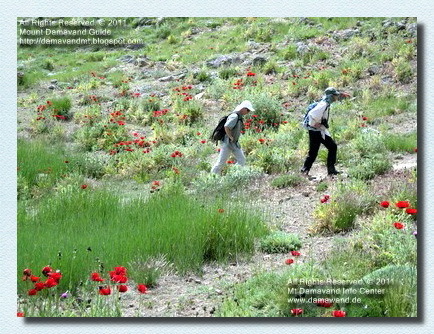 Tailor made tour for hiking trekking and mountaineering in Iran. 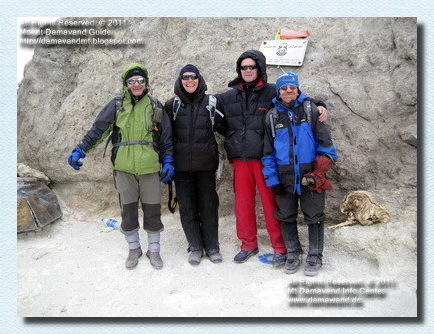 Qualified Iranian mountain guides for Damavand Guestbook and Recommendations - Damavand Tour. 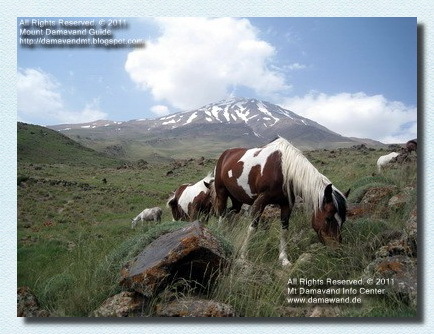 Damavand Guestbook, Trip Report and Travel Testimonial. damavand guestbook and recommendations, damavand tour guestbook, damawand trip report , damavand travel review, mt damawand testimonial, damawand guestbook and travel news, iran mountain travel news, damavand tour news, damavand tour experience. Useful links Damavand Info, Damavand Guides. Mt Damavand trekking tours 2015. Iran moutain Guided Tours. Mountaineering and climbing tour organizer. Tailor made Damavand tour. damavand, iran, tour, tours, climb, climbing, expedition, guides, hiking, trekking, volcano, pictures, photos, summit, ski, snowboard, traveler, travels, visitor, visit. Damavand climb, hike & trek tours 2015. Comprehensive info for Iran adventure mountain tour. Desert tour, absolute silence and peace, salt lake and caravansaries. Canyon, valley, island, lake, river, salt lake, swamp, waterfall, wetland tours.Alborz and Zagros Mountains hiking trekking tours. Ski mountaineering and snowboard tour organizer Tehran. Persian cultural travel guide, travel to Persia. Trek elborz & zagros ranges. Hiking outdoor tourism activity. Damawand climbing tours. Mountain guided tour. Winter ascent and ski tourung volcanic summit. Ascension Damavand, randonnée et trek visites 2015. Info complète pour la visite en Iran de montagne aventure. Désert tournée, le silence absolu et de paix, d'un lac de sel et de caravansérails. Canyon, vallée, île, lac, rivière, lac salé, marais, cascades, zones humides et de Zagros Montagnes tours.Alborz randonnées trekking. Ski alpinisme et snowboard organisateur de voyages à Téhéran. Persique voyages culturels guide de voyage en Perse. Trek & elborz gammes Zagros. Canyon, das Tal, Insel, See-, Fluss-, Salz-See, Sumpf, Wasserfall, Feuchtgebiet tours. Alborz und Zagros-Gebirge Wandern Trekking-Touren. Skitouren-und Snowboard-Reiseveranstalter Teheran. Persischen Kultur-Reiseführer, Reise nach Persien. Trek elborz & Zagros reicht. Wandern Outdoor-Tourismus-Aktivität. Damawand Klettertouren. Berg Führung. Winter-Berg-und Ski-tourung vulkanischen Gipfel. Damavand arrampicarsi, fare escursioni e trekking tour 2015. Informazioni complete per il tour di montagna avventura Iran. Deserto tour, il silenzio assoluto e la pace, lago salato e caravanserragli. Canyon, valle, isola, lago, fiume, lago salato, palude, cascata, le zone umide tours.Alborz e Monti Zagros escursioni trekking. Sci alpinismo e snowboard giro organizzatore Teheran. Persico culturali guida, viaggi in Persia. Trek & elborz gamme Zagros. Escursioni attività all'aperto turismo. Damawand climbing tour. Guidate in montagna tour. Invernale di risalita e sci tourung vetta vulcanica. 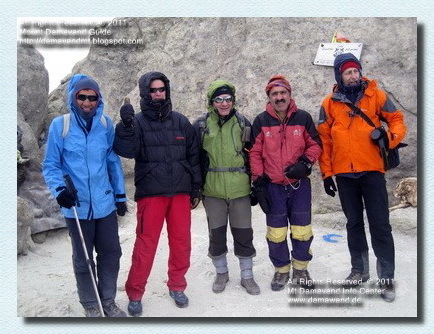 Damavand klatre, vandre & trek turer 2015. Omfattende info for Iran eventyr fjelltur. Desert tur, absolutt stillhet og fred, salt innsjø og karavanseraier. Canyon, dal, øy, innsjø, elv, salt innsjø, myr, foss, våtmark tours.Alborz og Zagros-fjellene fotturer trekking turer. Ski fjellklatring og snowboard tur arrangør Teheran. Persisk kultur reiseguide, reise til Persia. Trek elborz & Zagros områder. Vandring utendørs turisme aktivitet. Damawand klatreturer. Mountain omvisning. Vinterbestigning og ski tourung vulkanske toppen. Дамаванд подъем, экскурсии и туры похода 2015 года. Всеобъемлющая информация для Ирана тур горные приключения. Пустыня тур, абсолютная тишина и мир, соленое озеро и караван-сараи. Каньон, долина, остров, озеро, река, соленое озеро, болото, водопад, водно-болотных угодий tours.Alborz и Загрос походы походов. Горнолыжного спорта и сноуборда организатор тура Тегеране. Персидской культурной путеводитель, путешествие в Персию. Trek elborz и Загрос диапазонах. Туризм активного отдыха туризма. Damawand восхождений. Гора экскурсии. Зимнее восхождение и лыжных tourung вулканические вершины. Escalar Damavand, caminata y trekking tours 2015. Información completa para la gira de Irán montaña aventura. Tour del Desierto, un absoluto silencio y la paz, lago de agua salada y caravasares. Cañón, valle, isla, lago, río, lago de agua salada, pantanos, cascadas, humedales tours.Alborz y senderismo montes Zagros trekking. Esquí Alpino y Snowboard Tour organizador de Teherán. Pérsico guía de viajes culturales, viajes a Persia. Trek elborz y rangos de Zagros. Paseos al aire libre la actividad turística. Damawand escalada tours. Montaña visita guiada. Invierno de ascenso y de esquí tourung cumbre volcánica. All Rights Reserved.© Damavand Tour. All the material on this site is protected by copyright.